On the first Sunday of September, I headed for a movie theater. I wanted to see the film “Sekigahara”. The Battle of Sekigahara took place in 1600. It was a very large battle that was decisive in ending the period of warring states. Both the Western and the Eastern armies gathered in Sekigahara, a narrow basin-shaped valley. There was no escape route from this valley. Though there was a road passing through the basin, it could easily be blocked by either army, depending on the tide of the battle. With the escape route blocked, there was fierce mortal combat. I know the story of Sekigahara quite well, so you may wonder why I went to see the movie. It was because I wanted to see how the surrounding mountains were depicted in the film. The mountains surrounding Sekigahara are verdant. In the film, each camp is positioned in thick forest. I felt sorry for the director, as it would have been very difficult to show the battle in such conditions. According to Ryotaro Shiba’s novel about the Battle of Sekigahara, it is supposed that the movements of each of the armies could be clearly seen. Not only the movements of friendly camps but also those of the enemy were probably clearly visible. Therefore, the opponents could change their strategies in response to movements of the other side. The most famous scene in the film depicts the movements of the Kobayakawa camp. Hideaki Kobayakawa watched the battle, wondering which camp he should join. It is said that Ieyasu, irritated by Hideaki Kobayakawa, who wouldn’t move, fired a warning shot at the Kobayakawa camp in order to show his anger. Although the true story is unknown, Hideaki Kobayakawa, watching from a hilltop, betrayed the Western army and attacked the Western Army’s Otani camp. Seeing the movements of Kobayakawa, other troops began to attack the Western army one after another. It is certain that Kobayakawa’s assessment of the situation and his actions led to the victory of the Eastern army. All the troops gathered in Sekigahara, including most of those fighting and some camps watching the battle could look out over the whole valley at that time. However, the mountains shown in the film were covered in trees and it was difficult for me to spot the flags and spears in the thick green forest. I saw little of Sekigahara’s view on the screen. In these mountains, it would be impossible to re-enact the story of the Battle of Sekigahara without modern GPS systems. In fact, at the time of the battle the surrounding mountains would have been stripped bare of trees. Figure 1 shows the results of a study conducted by Conrad Totman, a British historian. 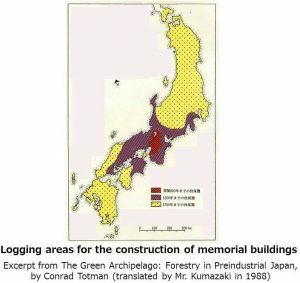 He visited temples and shrines across Japan, studied good-luck charms, and identified where trees were logged when the temples and shrines were built. This is a distribution map of logging sites. The parts coloured purple are areas trees were cut down before 1550. The year 1550 is in the middle of the warring period. During this period, trees were cut down on most mountains from Yamaguchi Prefecture in the west to the Izu Peninsula in the east, and from the Kii Peninsula in the south to the Noto Peninsula in the north. As a result, almost all the mountains in the Kansai district were stripped bare of trees. Until the modern Meiji Era, about 150 years ago, Japan’s only energy source was wood. In the 21st century, we live on energy from fossil fuels, and so it may be difficult to imagine mountains stripped bare of trees. However, the Japanese archipelago has undergone de-forestation several times. 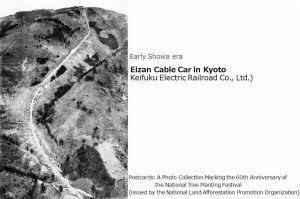 Below are some pictures of Kyoto from the Meiji through Showa eras. Picture 1 shows that the sacred mountain, Mt. Hiei was bare. There were few trees in the Kansai district during the warring period. Almost all the mountains were stripped of trees. The mountains surrounding Sekigahawa were also denuded. As a result, the whole valley could be viewed from higher ground. In a landscape with good visibility, we would easily be able to understand the story of the Battle of Sekigahara. In the landscape of today’s Japan, however, it must have been very difficult to make a film about the warring period. I enjoyed the differences in landscape more than the plot of the film. Tenth Meeting of High-level Experts and Leaders Panel on Water and Disasters (HELP) was held on September 21 2017 at Gyeongju, Republic of Korea. After dynamic paradigm shift of the international framework as well as Japan's framework of water-related issues such as the new beginning of the Sustainable Development Goals (SDGs), the adoption of the Paris agreement, the latest and historic agreement on the climate change, the adoption of the post-2015 framework for disaster risk reduction, the Sendai Framework and Water Cycle Policy approved by the Japanese cabinet, HELP encourages cooperative actions on reducing water-related disasters by nations and international organizations.